The History Girls: Leather Bikini Bottoms! A few days ago a new case appeared in the Roman Gallery of the Museum of London, near the marble head of Mithras. The display contains objects from the grave of a 14-year-old girl from South London. The girl lived around 1800 years ago in what was then known as Londinium. DNA and stable isotopes tell us she had blue eyes but grew up in the southern Med, possibly North Africa, before making the long sea-voyage to Britannia. 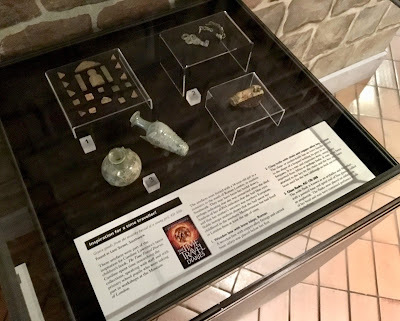 Three of the five objects buried with her feature heavily in my new Time Travel Diaries book and I am extremely grateful to curator Jackie Keily for putting them on display. I hope the artefacts will send kids to my book and vice versa. Artefacts are wonderful for creating the possible backstory of a character and these generated ideas for a story about a blue-eyed girl with an ivory leopard knife almost immediately. But sometimes artefacts inspire me in less obvious ways, and I’m certain this holds true of other authors. This happens when you write with Both Sides of the Brain. Memory masters know that it is often the juxtaposition of strange objects and images that helps fix dry facts or numbers in the head. That’s why they turn numbers into pictures and then link them to memorable images as with the Number-Rhyme System or the Number-Shape System. 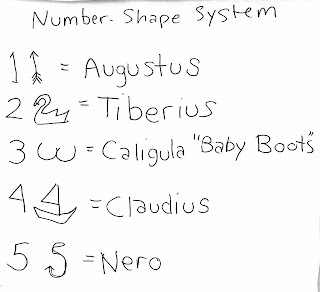 For example, I recently used the Number-Shape system to teach kids the first ten emperors of Rome in order. In less than ten minutes. You take a left-brain list of the first ten emperors, then make it right-brain-friendly by adding colour, image, movement, humour, rudeness and the five senses. Example? Number one looks a bit like an arrow. I get kids to visualise an arrow. Occasionally they can’t do it until I help them by being more specific. By linking an arrow (number one) with the month of August you will remember that Augustus was the first emperor. It sounds cumbersome, but it works because you’re using both sides of the brain: the logical, verbal, numerate left hemisphere and the non-verbal, imaginative right hemisphere. In the Number-Shape System, the number two is shaped like a swan. Make yours a giant one, swimming on the River Tiber. (Can’t visualise Rome’s river? Put a giant colosseum behind it. Or make it tiger-striped. Or both!) That will help you remember that Tiberius was the second emperor of Rome. A number 3 on its side looks like a baby’s bottom. Imagine patting talcum powder on a smooth baby’s bottom and then noticing he’s wearing baby-sized Roman boots. 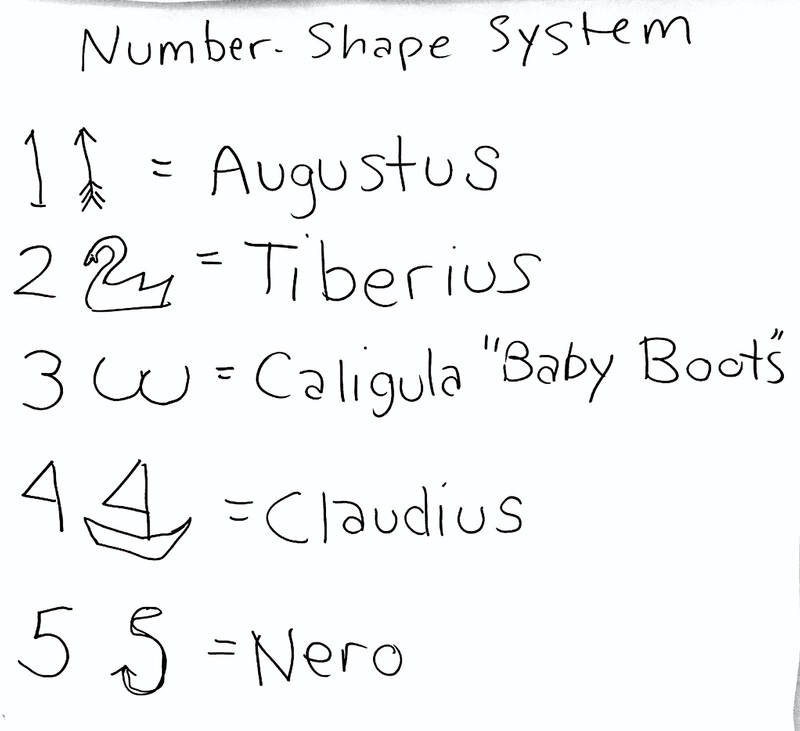 The word for ‘Baby Boots’ in Latin is Caligula! And so forth. By making boring facts visual and linking them with bizarre, funny, colourful objects you help cement them in your memory bank of stored images. In the same way, juxtaposition of unusual artefacts often inspire scenes in my books. 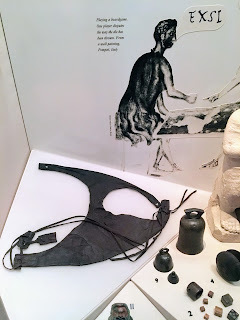 For example, there are a pair of Roman leather bikini bottoms now on display in the Museum of London. These are one of two pairs (!) found in a Roman well. Experts think the bikinis might have belonged to girl acrobats. Near the case displaying the leather bikini bottoms is a delightful model of the port of Roman London, one of my favourite items in the museum. Great screenwriters like Orson Welles, Stanley Kubrick and Paul King (the Paddington writer/director) know the power of miniatures. 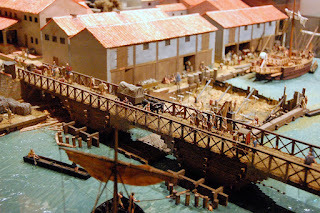 I love to stand there and look down at this model of Londinum’s port. The longer you gaze, the more you see. 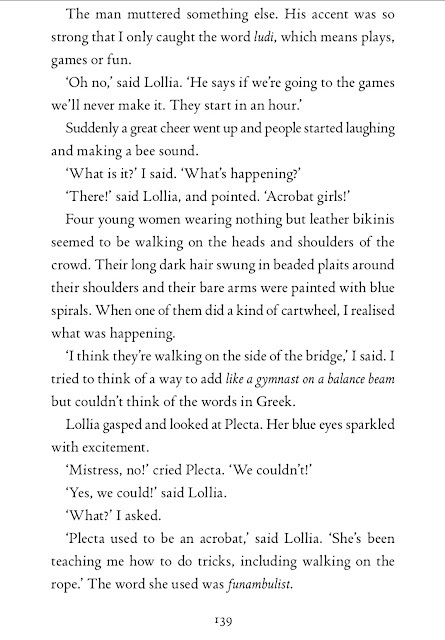 Remembering some re-enactor acrobats I’d seen at a weekend of Gladiator Games in Nîmes, I suddenly had the image of girl acrobats walking along the side of London Bridge, like gymnasts on a balance beam. That gave me the idea that maybe my young hero Alex has to get to the north bank fast but there is a traffic jam on the bridge. 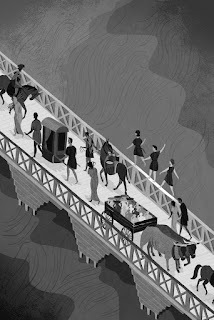 Sarah Dhanjal once mentioned that it took an hour to cross London Bridge in Medieval times. Impatient to cross the bridge in order to get to the gladiator games in Londinium’s amphitheatre, Alex hears the crowd of people begin to laugh and buzz like bees (a popular method of applause in Roman times). 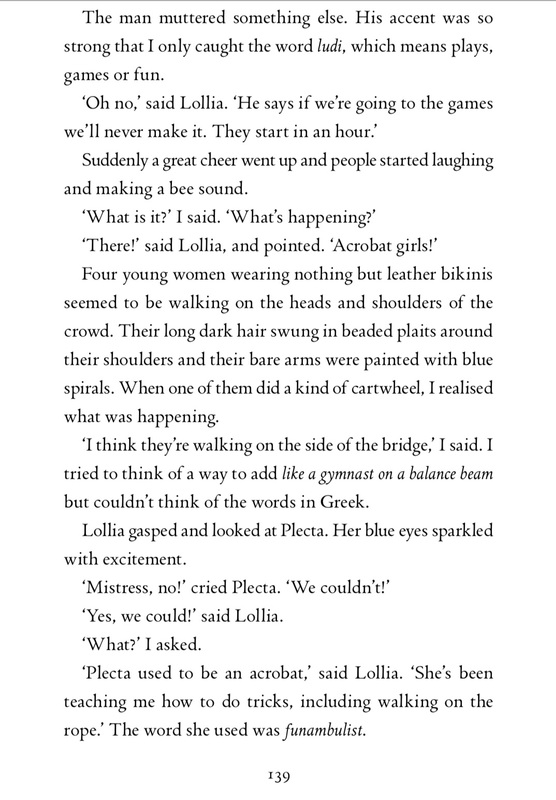 Alex and his two friends see the reason: four leather-bikini-clad girl acrobats doing cartwheels on the guard rail. The sight of the girls making their way across the side of London Bridge gives Alex and his friends an idea. They can copy the girls and walk along the guard rail, too. This is a great idea because it also involves ‘Crossing the Threshold’ another one of my favourite mythic plot beats, where the hero leaves one world and enters another. As Romans knew, thresholds can be magical places. 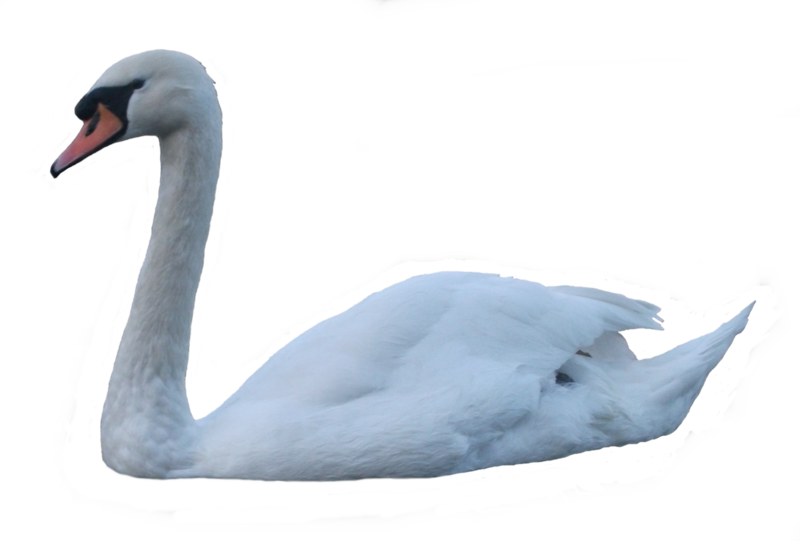 As I visualised the scene, using all my senses, a something happened that I had not consciously considered. Alex falls, but not in the way you think… Or maybe you can guess! That’s the magic of using both sides of your brain when you write by linking concrete artefacts and the sensory imagination. I’ll be sharing all my best writing tips in my next book, How to Write a Great Story, out August 2019.